A coalition led by the National Space Society and other space organizations is helping to advance legislation that will clarify and streamline a muddled and uncertain regulatory regime faced by the emerging American suborbital space flight industry. The Commercial Space Act of 2003 (HR 3245) has been approved by the House Space & Aeronautics Subcommittee, but still needs approval by the full Science Committee before going to the floor for a vote. 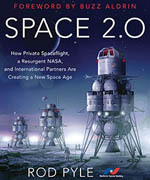 The bill, introduced by Rep. Dana Rohrabacher (R-CA), Rep. Ralph Hall (D-TX) and Rep. Bart Gordon (D-TN), directs the Secretary of Transportation to set up an enabling regulatory regime for commercial human space flight, separate from that under which the FAA governs commercial aviation. The coalition issued a statement to demonstrate its common purpose and objective. An executive briefing on the suborbital industry is available online. You can also read more about the legislation at Spaceref.com. NSS members are encouraged to contact their U.S. Representatives and ask them to cosponsor HR-3245 so that it can continue advancing in the legislative process. 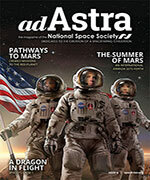 The National Space Society is supporting efforts by U.S. Senator Michael Enzi (R-MT) to exempt model rocketry from new federal regulations that could cripple the hobby. NSS sent a letter to the Bureau of Alcohol, Tobacco, Firearms, and Explosives this week indicating the importance model rocketry to recruiting new students in the aerospace fields. Several teams of NSS members fanned out across Capitol Hill in April, visiting the offices of nearly 100 lawmakers during the first NSS Legislative Conference, asking them to support space exploration and to fund ongoing efforts to reduce the cost of access to space. The NSS members were joined by members of ProSpace and the Mars Society, demonstrating that diverse organizations can find areas of common ground. Before visiting the House and Senate offices, the team members received briefings from senior NASA and Department of Defense officials, Capitol Hill staff, and space industry analysts. NSS Executive Director Brian Chase was one of three witnesses to appear before the U.S. Senate Subcommittee on Science, Technology, and Space to discuss the future of space transportation and human space exploration. Safe, reliable, and low cost space transportation is vital to all aspects of the exploration, development, and eventual settlement of space. In light of the loss of the Space Shuttle Columbia, the United States will be reassessing its space transportation policies, and the National Space Society recommends the following key tenets as a foundation of that policy.